Amun’s involvement in human life is well illustrated by a myth taken from the walls of the Birth House at Deir el-Bahri, the great temple of Hatshepsut. Kings were believed to assume their divine nature as a result of having been conceived by the chief god. For Hatshepsut, who ruled in the Eighteenth Dynasty, this myth had additional value, for she was a female king complete with false beard. Both ambition and ability took her beyond the limited roles normally assumed by women at the time, and through means both fair and foul she usurped the throne. Justifying her action was, therefore, unusually important, and she took care that her temple fully recorded her divine paternity. Amun-Ra met in council with the most powerful and important gods to seek their advice. They had to settle the succession to the crown, and Amun-Ra announced that he was to be Hatshepsut. Plans were made for Amun-Ra to seduce the consort of the reigning king. Thoth identified the woman as Aahmes, renowned for her great beauty, wife of Thutmose I, king of Upper and Lower Egypt. Amun-Ra assumed the shape of the husband so as to obtain his way without dispute or force, and Thoth led him to the mortal woman. Not suspecting that a god walked before them in disguise, the guards at the palace allowed what they thought to be the king to pass into the queen’s rooms. She lay asleep on her bed and her sensual form aroused him. Disturbed, she awoke to see the figure of her husband before her and she eagerly welcomed him to her bed. Amid divine passion the future king of all Egypt was conceived. I am forming you of the substance of Amun, god of Karnak. I give you the lands of Egypt and her people, and I will have you appear in glory as king in the role of Horus. You will be supreme among men, as has been commanded by your father, Amun-Ra. Amun-Ra then sent Thoth, messenger of the gods, to Aahmes to tell her of the chief god’s pleasure with her conception. As reward, Thoth presented special titles that made her stand out from other women. As her time approached, Aahmes walked to the Birth House escorted by Heget and Khnum who told the woman that her child would be greater than any king who had lived before her. Amun-Ra himself led the joyful group into the special rooms. Once inside she was greeted by Meskhent, goddess of birth. Close by was Bes, divine protector of new mothers and newborn children, as well as god of music, dance, and jollity. Popular among kings and commoners alike, he was recognized as protector of domestic happiness, encourager of toilet training, and even at times the supervisor of the bed and its pleasures. He was a bow-legged dwarf with a roundish face and large, animal like ears. His nose was wide and flat, his eyebrows prominent, and his face heavily bearded, but in place of hair on top of his head, he usually had feathers. His grotesque appearance was intended to frighten away snakes and other creatures that threatened Bes’ human charges. The birth was an easy one; the assistance of all these divinities had assured Aahmes that all would go well. Soon she was seated holding the infant who would seek so much of the known world. The goddesses present offered Hatshepsut the ankh, the sign of life, and Meshkhent granted her the attributes that would make her happy as a woman. Next Hathor presented the baby to her immortal father. As the cow goddess held out the child, Amun-Ra blessed his offspring, “You will be king of all Egypt and will sit on the throne ° Horus. Welcome, child of my own body.” Hatshepsut was suckled by a cow-headed goddess; Anubis rolled a disk to determine e length of her reign. Once weaned, she was served by Iat, goddess of milk, and guarded by other goddesses who took special interest in their important charge. The girl was finally taken back to Amun-Ra, who was accompanied by Thoth. Together they inspected the growing girl and approved her progress. As a final act of charity, Amun-Ra again granted her life, strength, health wealth, and eternal life on the throne. A god of such power was honored widely and magnificently. 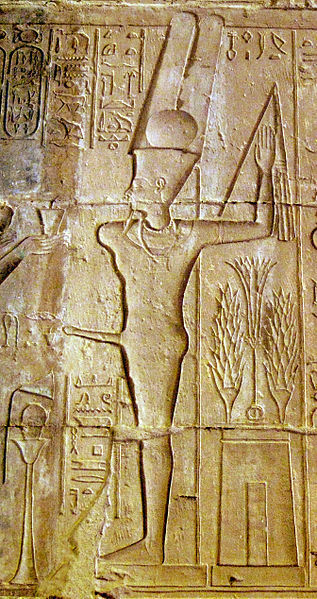 Wall carvings at the Temple of Luxor describe in detail rituals performed in Amun’s honor each year during the Festival of Opet. At the height of the flood Amun was taken from his residence at the Temple of Karnak to visit his female friends at the Temple of Luxor several hundred meters to the south. The festival opened with dancing girls who accompanied the priests of Amun as they carried the barge holding the statue of the god to the water’s edge. Then men towed the barge up river to the other temple while the audience clapped, animals were sacrificed, and acrobats tumbled joyously. Finally at the second temple, offerings were made to the holy triad of Thebes. The great seat of Amun’s worship was, of course, the Temple of Karnak. The largest religious shrine in the world, it was begun during the Twelfth Dynasty and added to and modified by every ambitious king up to the Graeco-Roman period. One king would decorate a temple, another would build a courtyard, others added the wall, and Hatshepsut erected two obelisks. Here Amun-Ra was worshipped in a grandeur known to no god before him, and few since. The worship of Amun-Ra was interrupted in one of the more curious theological events of ancient Egypt. 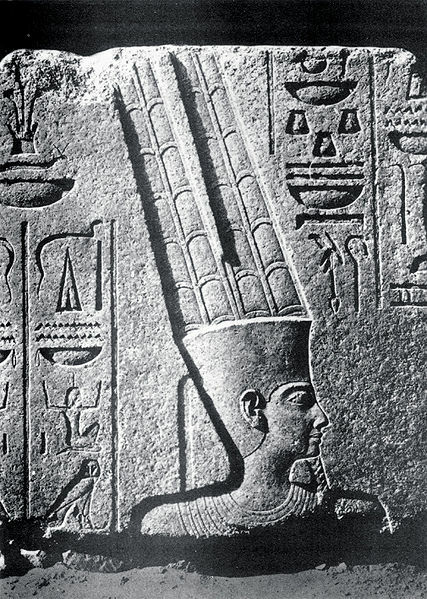 Amenhotep IV, also known as Akhenaten, gave Egypt a brief period of monotheism during which he made every effort to stop the worship of Amun-Ra He moved his capital to Tell el-Amarna, between Cairo and Luxor, and put his faith in the worship of Aten (variant spelling, Aton), who was envisioned as the sun. 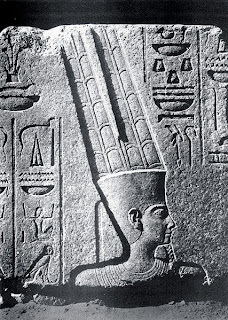 Ra and Amun were seen by the followers as personifications of the sun, but Amenhotep IV rejected the personalized god in favor of a less human deity. He discouraged the adoration of the god in human form and substituted the worship of the sun’s rays. 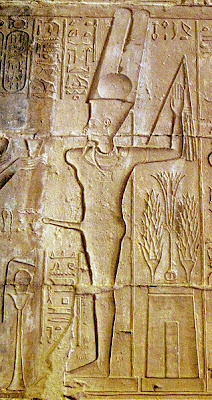 The worship of Aten was short-lived and within a few years Amun was reinstated under the guidance of the boy king, Tutankhamun, who set about restoring the monuments of Amun defaced during the period of “heresy.” In spite of the post-Akhenaten destruction and defacement of monuments, some artifacts connected with the worship of Aten can be found in the Egyptian Museum, and the ruins of Tell el-Amarna, about sixty-seven kilometers south of Minia, can be visited.